This is the first set of photos of, I guess, the theme "Soviet life"; and includes stuff from my one and only trip to the actual SU, in 1991, and stuff from subsequent life there and trips 1992 and a while after that, when there was still some common 'Soviet' theme, at least that I could see. That was a long time ago. 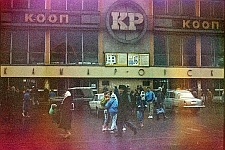 "this one is minsk 1992. It's a roll of kodak print 400, i think, that i'd accidentally shot at ~1700 before I noticed. So I took it out of the camera when I saw that crazy setting!, at about photo 13, and didn't develop it until - 2004! (when I was doing some c-41 and could push it that far; no reputable yet cheap enough for me lab'd do that). tried a few fast photoshop zaps, though very little changed in the photo as if stubborn. so this isn't going to change much from what we see here... i like it." ... so, here it is, very colourful. I do like it. 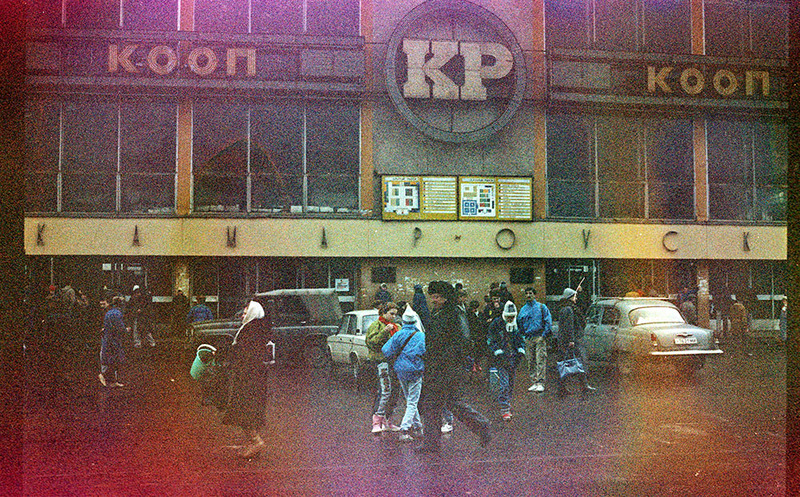 I spent a lot of time shopping there when I lived in Minsk 1992-1993, and before, and after; some odd hours, too. There are stories, stories. Those were the days.